So out of the simple clothing posts I'm writing, this one is obviously the most fun, because tiny baby girl clothes are just the best! Ever since I found out I was having a girl, it's taken a bit of self control not to overspend on adorable things for her. 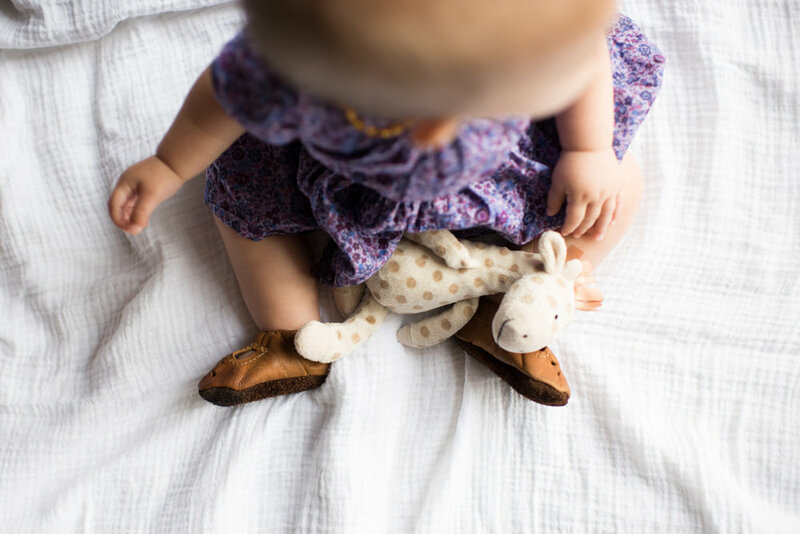 When approaching what to purchase for Eaden, I aim to limit it to a few simple and high-quality items in natural materials. For the summer, I love Burt's Bee's organic cotton camisole onesies, paired with some bloomers. I found a couple pairs of ridiculously cute handmade bloomers from Wee Vintage Baby. They're perfect with the onesies or a little tank top or t-shirt. My other favorite for her is rompers. Classic, sweet, cool enough for the summer heat, and nothing beats the simplicity of a one-piece outfit! These two are from Peek and Numero 74. For scoring amazing, quality items that are gently used and super affordable, the Kidizen app is wonderful! Purchasing pre-loved clothing rather than new leaves a much smaller footprint on both the earth and our bank account. I also sell some of the things she outgrows, sometimes for exactly the amount I bought them for! I'm fully aware that shoes are completely unnecessary for my crawling infant, so these leather t-strap sandals were sort of a petty splurge purely for my own amusement. (We all get to do those things once in a while, right?) Aren't they precious?! I won't be buying her more shoes until she walks though. We also have a few super sweet dresses, some headbands, various onesies, and footie pajamas. And a swimsuit, which also isn't really necessary, but look at it! (below) I believe a little bit of superfluity is alright here and there—it keeps things fun! She has two drawers- one for clothes she currently wears and one for things she'll likely grow in to in the next few months.